To me Vedder Mountain is the best place on earth, the dirt is very unique with its clay based soil and deep loam. There is a ton of trails most people don't know about, and a lot of mainstream stuff people just cant get enough of. I learned to ride at Vedder almost 20 years ago. Vedder has the steepest climbs around and the craziest flow on the descents. Its not the most ideal place to achieve a 10000ft day. But this is sport, nothing is ideal. To put 10000 vertical feet into perspective, the summit of the iconic mt baker is 10,781 feet above sea level. Mike and I at the start of the ride along the rotary trail. First Leg - Depart the Rotary Trail parking lot and take the Rotary down to Yarrow where we'll climb up Duck Farm, then onto the 'ring road and up to Hang Gliders. Descend Hang Gliders and get onto Goony that takes us the the Den climb. Up to the Den and then descend to the lake = 4,000ft. Thirteen of us came out for the ride, which is more than I thought would show given how bonkers the planned route was. Pretty cool to see so many people into it! We lost one dude to a mechanical at the top of Duck Farm early in the ride, but everyone else did the first 4,000ft lap that had the best trails on it, singletrack that's pretty tricky to link up so it was rad to show out-of-towners what we have here. Logan flatted on the Den and had to fix it twice, but it was flawless except for that and Nathan from clearbook coffee making a wrong turn on Goony. Crazy to think that only one person missed a turn, and he was local! We lost a few more after descending down to my van for pizza and drinks before climbing back up the new trail and then up past Reefer and up Tripower. The decent back down the other side of Tripower has to be the highlight for me - so much loam, so green, and great to see the grins on the first time tri power riders. Then was an easy spin/bush whack up the Old Man's rd to the base of Tower rd before the poo really hit the fan. Tower road from the Yarrow side is the steepest gravel road I have ever seen, just looking at it makes you want to puke. But 5 of us make it up and started the descent down to the lake, Logan had a nice crash at the top of the steeps but was ok. Light was fading at this point and we still needed to descend back to the van and then climb another 1,500 feet up. That's when my derailleur cable snapped and I was stuck in my hardest gear. That climb back up to Two Cents in the near-dark was a pretty solemn affair, with the five of us just going our own pace due to pure exhaustion. I ended up using a G3 ski strap to rig up my derailleur up so the chain was in the easiest gear, and we all got to the top of Two Cents at dusk before riding down like a bunch of hacks... It was touch and go between the low light and how tired we were. But we all made it down safe and exhausted. 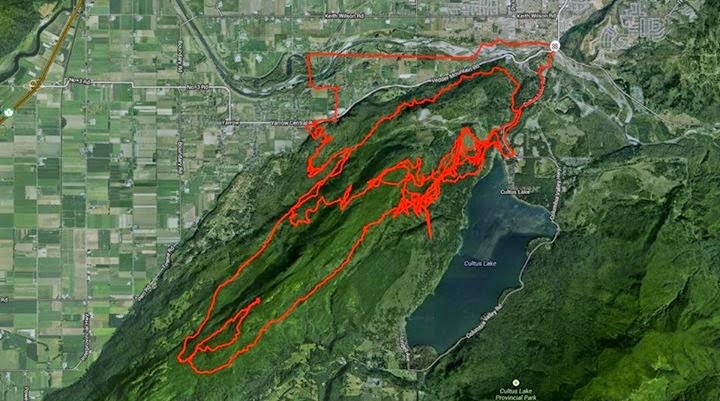 According to Mikes Garmin we did 94km in total, with 10,056 feet of climbing, and I think we rode pretty much every mountain bike trail on Vedder. Five riders out of the thirteen that started the ride managed to complete it. We could have done a Ten Grand ride at almost any other location and had a much easier, quicker time of it, but it felt fitting to make the first Ten Grand group ride on the hardest, steepest mountain in the Valley. The numbers, while impressive, don't really do the ride justice as I think it was a lot more difficult than it looks.